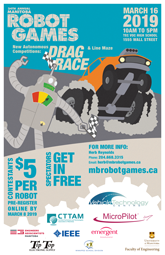 The Manitoba Robot Games is host to one of the most exciting science events in Manitoba, and this year’s event will take place on March 16, 2019 at Tec Voc High School. The following links will take you to pdf pages of the individual rules, but be sure to go first to the General Rules as these apply collectively to all the competitions. Please use your browser’s “back” button to return to this page.